There comes the Thanksgiving Day, then is Christmas. Still looking for a suitable Christmas gift for adults or children? Why not present them with this 3D VR glasses? It is good as gift for different festivals. Mobile Virtual Reality is right here! You wanna experience IMAX movies any time and anywhere Just put on this VR glasses, it immediately drop you into the action ! Anti-allergy memory sponge and ventilated air vents offer well heat dissipation. Fit for all ages with adjustable and flexible head band. Two kinds of mode, turn it to the game mode and it become a gamepad, turn it to the key mode and it can control the camera and music of the phone. Multiple functions: Gamepad, Wireless mouse(just for Android), Bluetooth Selfie, VR controller, Music controller, eBook page controller. More Apps: easy to operate and download Apps on google play,Youtube and apple store ,All video source can be found on Google. Anytime, anywhere IMAX3D viewing,Just insert smart large screen phone , immediately expenence IMAX 3D shock movie. This VR glasses headphone jack. The iPhone 7/7 plus iPhone 8X need a convert plug to connect to the headphone of the vr headset. ★VR 3D professional PMMA lens imported from Japanese our VR glasses are more clear and scratch resistance in the market .Blue lights coming from mobile phones do damage to the eyes. With blue coating film, the lenses of this headset can reflect the blue light of your smartphone, safeguarding your eyes. ★Adjustable pupil distance and object distance to satisfy different groups of people.The front cover is magnetically attached and can be easily removed to improve ventilation and keep your device cool. 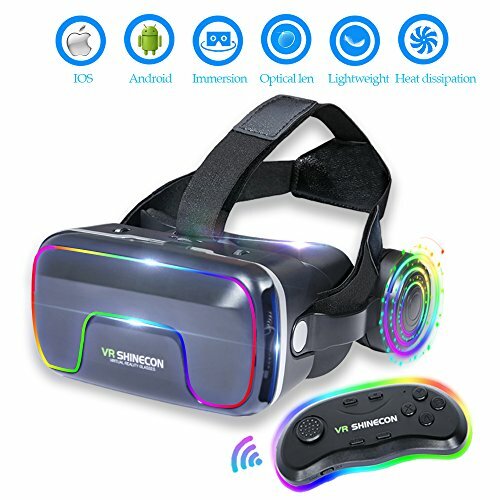 ★Latest VR glasses make you go into 3D virtual reality viewer, enjoys watching the latest Hollywood blockbusters or playing video game anywhere, anytime, offers you the best vr experience, like you are in 3D home cinema. If you have any questions about this product by EKIR, contact us by completing and submitting the form below. If you are looking for a specif part number, please include it with your message.